This one I worked in layers. For the base layer, I felted a fine layer of light pink over some green wool I'd fulled in the washing machine. I stitched a pebbled pattern onto it. 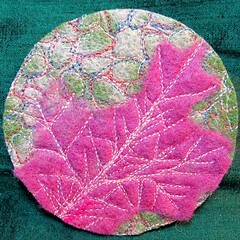 The leaf started as a thin layer of darker pink wool felted without any backing in the felting machine. That gave me an airy, open fabric to work with. I cut out an oak leaf shape, and stitched that down onto the base. I have a critique for it: I think the leaf is a good beginning, but it could be even whispier. I like the stitching on the leaf, but the stitch colors could stand out more. Two layers attached with stitch makes a stronger statement than the previous circles. I'll try this again, with a thinner leaf, more contrast between the leaf and the veining colors, possibly more weight contrast in the thread used as well, and a background I like better. My best news today is that my sewing machine is home!!!! I am so pleased. While Timna's machine worked like a champ, I have spent the last long while improving my skills and rapport with my machine.